Best comforter ever! I use this year round. I feel like it has some sort of temperature control magic. I live in Wyoming where the weather constantly changes. I've almost had this year and never had to change it out for a thicker or lighter comforter. This plush down alternative duvet comforter has all-season fiberfill with white microfiber fabric. The durable construction and machine washable materials make this comforter ideal for everyday use. We decided to get a new comforter because all the feathers of our former comforter were at the foot and when you share your queen size bed with a 110 pound lab, I end up with almost no cover. So the research began for a king size comforter for our queen size bed. Should we get another down comforter or go with down alternative? This was the biggest question. I decided to try down alternative. Great now I have to find one that meets my needs because I'm very picky and my husband could care less. I like thick fluffy comforters that have heaviness to them. After hours of research, I had it narrowed down between this one and one on another site. The price on the other was 3 times as much so decided to go with this one instead. If I didn't like it, I would be out a lot of money. The pictures on the website show it fluffier than the way it looked on my bed but it felt just as fluffy as the the picture. Ok, the first requirement has been met. The weight is just right. Not too heavy but not too light. I slept like a baby. Requirement number 2 - check. Now I'm very cold natured and my husband is hot natured so we disagree at times on whether it's too hot or too cold in the bedroom. It kept me nice and warm (without the 3rd blanket I normally have on my side) and my husband didn't complain about being too hot. Requirement number 3 - check. So if you are unsure about which comforter to buy - buy this one!!! You won't regret it! This is a nice down alternative duvet. I was a little disappointed in the “fluffiness”, however. In the picture it looks much fuller and fluffy. It feels great, and sleeping underneath it, is wonderful. I'm not sure if I read the sizing correctly. I ordered a King, but noticed on the packaging, that a twin was much more narrow, but 82" long. The queen was 82" wide by 82" long. I went with width, then length, because of the twin. The king, was also 82" and then longer. I'm wondering if it was meant to be length by width on the kind, which would have been opposite than the way it was stated on the twin?! This is a nice comforter, but it doesn't cone close to looking like the image. It's nowhere near as full, and the filling is your typical batting type of fill you'd find in any generic comforter. That being said, it's very lightweight and fairly comfy. It is pretty warm, which depending on your climate might be good or bad. I found it a little too warm and it doesn't have the softness of down, but it does the job just fine. I don't see it lasting too long as I've only had it a week or so and its already lost some of its original loft, but it's decent for the price. VERY DISAPPOINTED!! I searched for days looking for the most fluffy, luxurious down alternative comforter, and this picture and some reviews caught my attention. However, what I received was nothing more than a FLUFFY SHEET!!! I was so upset when I opened this package. Others have said to give it a few days to fluff up after tight packing. Well... there is no amount of time or technique to get this anywhere near what the picture looks like. I have actually seen this picture used to advertised on other sites as well. So...I would tell anyone who is looking for a comforter NOT to buy this. BUT...if you are looking for a fluffy sheet, you will like this. On a positive side, the fabric is silky, smooth, and quiet, and the stitching along the edge is very nice. Overstock was great with shipping quickly, updating delivery dates/times through e-mail and text, and the customer service was great handling this return. Light comforter, bright white, perfect for my daughters bed! This comforter is so worth the money. Its the perfect thickness for year round and is fluffy and very white. Would buy it again and again and recommend it to everyone. Priced right. You'll be happy with it. Ours is oversized king and it hangs down at least a foot all the way around. This comforter is really terrific. Light weight, yet keeps you comfortably warm at night. Doesn’t weigh you down . Just kinda floats on top of you. Highly recommend this product. This is a great duvet! It's a quality purchase and really soft and warm. Duvets can be expensive and this was such a great deal. Very happy with my purchase! I was expecting a fluffy, plush comforter like the picture shows but this was VERY flat. It's not necessarily a bad comforter if flat is what you're looking for, but the picture is extremely deceiving. I returned. Not as plush as real down but is light weight and cozy. It's soft and warm (for my 68°F room) but not plush. It’s closer to a full-size than queen on an average queen-sized bed and is even smaller over my feather bed. I was told it would be almost $15 to ship it back, not including the purchase of a new package from the post office. I decided to just keep it and shop elsewhere to purchase a different one. BTW, you cannot exchange, only return. The blanket itself is nice. It is warm and snuggly, but it is NOTHING like the picture. Overstock was more than happy to help me with the situation, so this is not at all a “bitchy” review. However, I want other people to know, the comforter you order and the one you get are not the same. Fabric is nice, it was advertised as extra fluffy, but it wasn’t. So I returned it. 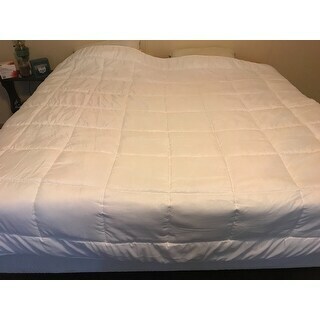 Super soft, very comfy, yet lightweight comforter. Warm enough for the winter without making you feel suffocated. Love that it is hypoallergenic, and arrived very quickly! I bought this for my husband as he loves to use a down type comforter on his side of the bed. It is made well and very fluffy. Good buy for the price! very thin and poor quality. "How much does this comforter weigh?" "Will the king size become available again?!" We do not if the king will be restocked. "Does this have loops on the corners for a duvet cover to tie to ?" Yes, this comforter does have ties to use with a duvet cover to secure the comforter in place and not have the comforter shift from place to place. "What is the fill weight for a Twin?" The Fill Power is 600.